What were those three witches really up to when they weren't making predictions about Macbeth's future? 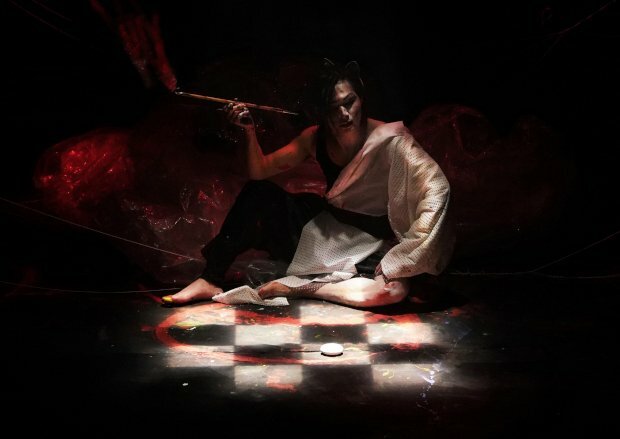 According to About Lady White Fox with Nine Tales from South Korea's Yuva Arts, they had an agenda of their own: to accompany the show's eponymous protagonist (maybe Lady Macbeth, maybe the enigmatic Lady White Fox, maybe some combination of the two figures) on her mission to eat the King's liver, and thereby finally become a human herself. At least that seems to be the gist of this rather overwrought, shriekingly intense show from Yuva's eight-strong company, performed in Korean and supertitled in English. There are good things here, not least the group's carefully choreographed, lithe movement, which they pull off faultlessly. The pounding, multi-percussion accompaniment to their pivotal exorcism scene, too, is compelling and memorable, and there's some evocative paintbrush calligraphy on the stage floor and back cloth. But the ensemble's neo-expressionist delivery – all grotesque grimaces, wailing and shouting – quickly grows wearing, and scene changes, with their inexplicably abrupt fade-outs of music, are needlessly clunky. Simply shoving in bleeding chunks of German expressionist classics – mainly Schoenberg's Pierrot lunaire – as generic musical backdrops serves to alienate rather than illuminate. A lot of effort has gone into this smooth production, but the end results feel rather baffling. Assembly George Square Studios, until 27 Aug, 1pm, £12-£13 (£10-£11).